What does MOREA Naturals Hyaluronic Acid Serum do? Not one of the prettiest serum packages, but this serum certainly makes up for a lack in looks with a powerful rejuvenative punch. This hyaluronic acid serum reduces the appearance of fine lines and wrinkles in your face and neck area and gives your skin a much healthier glow. Your skin tone and texture is smoother and much more hydrated, giving you a more youthful and brighter complexion. Boosts moisture and improves skin tone and texture. Improves dark circles under eyes. Vegan 100% pure hyaluronic acid. Who should use this Hyaluronic Acid Serum? This serum is great for people who have dry or flaky skin or are seeing the signs of aging creeping on and want to add an affordable serum to their beauty routine. So if you have tired, dull skin, puffy eyes or dark circles under your eyes, fine lines and wrinkles or have lost some of the tone in your skin – this is perfect serum for you. The benefits of hyaluronic acid serums are seen best when you apply a small amount of the serum to your face and neck area, after you have cleansed and toned your face (don’t worry about the toner, only use one if you normally include it in your beauty regime). Make sure your skin is still damp before you apply the serum and then let the serum absorb into your skin and dry completely, before applying a moisturizer and makeup (if desired). One of the problems with hyaluronic acid serums can be that they dry the skin (which is weird because hyaluronic acid is a super hydrator!). SO the way to avoid this happening is to mix your serum with your moisturizer, a solution that many customers have found to be very successful. The sellers of this serum offer a 100% money back, lifetime satisfaction guarantee. Also, they state that normal dropper bottles do not prevent serums from spoiling and only an airless pump bottle, like the Morea Naturals, can preserve these serums. This hyaluronic acid serum with vitamin C is 72% organic, paraben free, cruelty free and is made in the USA. The key ingredients in this serum are VEGAN hyaluronic acid, vitamin C and green tea. Hyaluronic acid is not actually an acid, it is a carbohydrate and it is a super hydrator. In fact, hyaluronic acid can absorb more than 1000 times its own weight in water and has been called the fountain of youth, because it can give your skin an intense boost in moisture. Hyaluronic acid deeply moisturizes your skin and plumps-up your skin, reducing the signs of aging, such as fine lines and wrinkles. The result is that your skin looks healthier and more youthful. Vitamin C is a super antioxidant and helps to fight and reverse the signs of aging caused by free radicals. 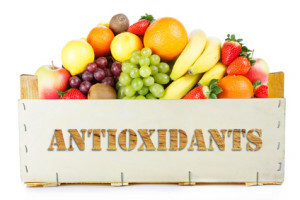 This antioxidant is also essential in would healing and cell regeneration and helps promote the production of collagen in our skin; it has a rejuvenative effect on our skin, when applied topically in a serum. Your skin looks brighter, dark circles under your eyes are reduced and your skin tone is more even and brighter. Green tea is also a super antioxidant, in fact it is even stronger than vitamin C and helps to reduce the signs of aging we see in our skin and give us a healthier and younger looking complexion. PROS: 95.0% of all customer reviews have given this serum either a 4 or 5 star rating. Customers have found that this serum makes their skin softer, younger and more moisturized, that it is absorbed well into their skin, it has helped to clear up acne and that their skin looks smoother and their pores seem smaller. There are a number of solicited reviews (easily spotted) that give 5 stars, but there are also a high number of, what appear to be, unsolicited reviews as well. 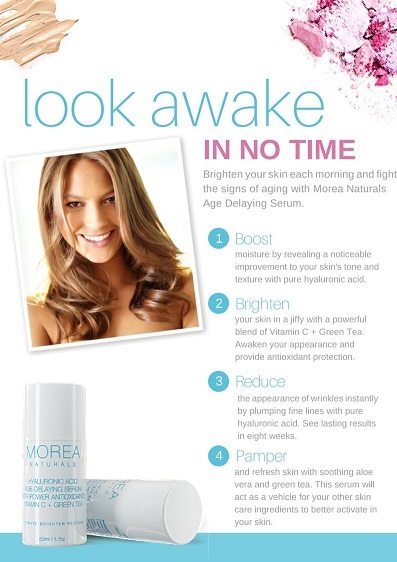 CONS: Only 1% of customers have given the MOREA Naturals serum a one star rating and the reasons were because they did not see any difference in their skin after using this serum. I tend to have dry areas around my T Zone and this really moisturized it. It does add in the softening of fine lines and there is a “brightening effect” to the skin. I highly recommend it especially for people looking for a chemically safe product for their skin. 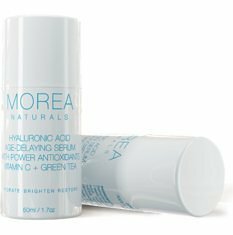 Does MOREA Naturals Hyaluronic Acid Serum work? 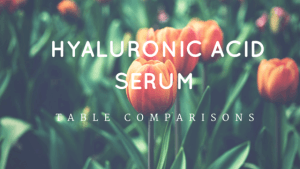 Well, with 95.0% of customer reviews giving this serum a 4 or a 5 star rating, this serum clearly comes out as one of the top rated hyaluronic acid serums. Customers definitely state that their skin feels smoother and softer and looks younger with this serum. 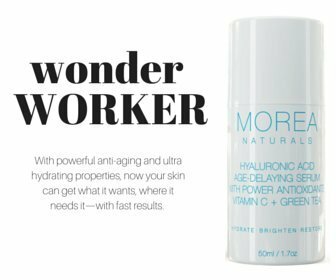 So if you are looking for a very affordable youthful serum, then adding the MOREA Naturals Hyaluronic acid to your skin care regime should do the trick! Compare the Morea Naturals Hyaluronic Acid with other top selling serums.